Thank you for visiting the Arashi-art to wear website. Please sign our guest book by emailing your comments to guestbook@(NO-SPAM)arashi.ca Note that you need to remove the (NO-SPAM) for this address to work. Please include your name and adress along with your comments. (We'll only use your initials and city when we update our guestbook.) Check back often to read other visitors' comments. Just wanted to let you know the scarves arrived and I’m so glad I waited to hear from you rather than settling for something less. They really are beautiful. The blue and green one matches the colors on my business card for my new business so I think I will try to use it when doing presentations. Love the colors and the texture! Do you teach classes? Really your work is very very beautiful, I love it so much. I love my velvet scarf. I get LOTS of compliments. Saw your work at the Mary Black exhibition and couldn't resist visiting your website. Your work is amazing! I purchased one of your beautiful pleated velvet scarves at the Museum of Civilization. The texture is wonderful and I get lots of compliments. Just wanted to let you know. A friend told me about your web site. It looks great, I'm so impressed! Your work is beautiful, really beautiful!! I had googled arashi and shibori and got many hits but yours was far and away the most gorgeous of all. The scarves are crisp yet fluid and the colors are just luscious. Wow! 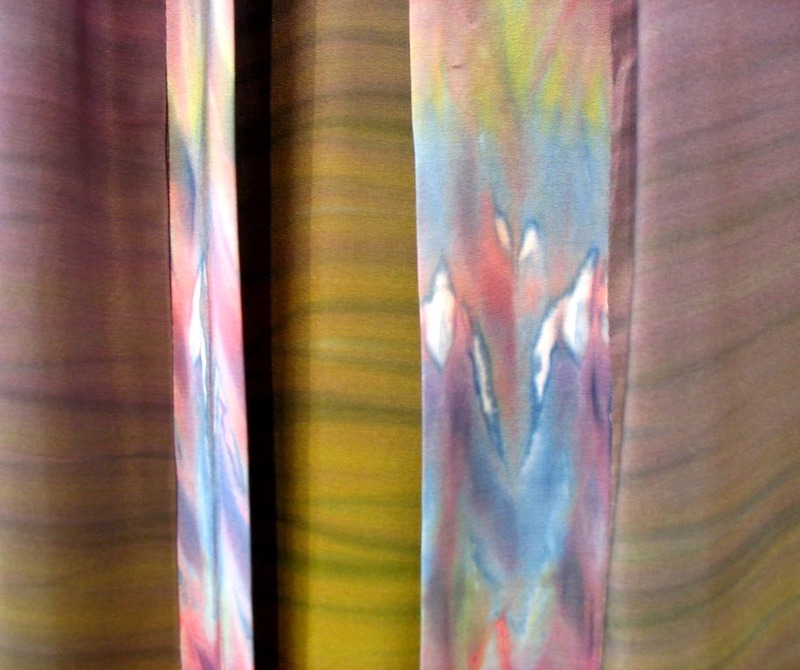 I love the new shibori pleated crepe scarf on your site. Your work is lovely! Amazing shibori pleats. How do you do it? Beautiful website! I love your work. Thank you for creating the lovely pleated scarf in my special colours. It is beautiful! I am a fiber artist of a different media---yarn. I love your work. I love the scarf - you did a wonderful job with the colours!